Conflict and crisis communication is the management of a critical incident which has the potential for resolution through successful negotiations. This can include negotiating with individuals in crisis, such as those threatening self-harm or taking individuals hostage as part of emotional expression, and also critical incidents such as kidnapping and terrorist activities. By focusing on the empirical and strong theoretical underpinnings of critical incident management, and including clear demonstrations of the practical application of conflict and crisis communication by experts in the field, this book proves to be a practical, comprehensive and up-to-date resource. Discussion of relevant past incidents - such as the 1993 WACO siege in the United States - is used to enhance learning, whilst an examination of the application of critical incident management to individuals with mental disorder offers groundbreaking insight from clinicians working in this area. 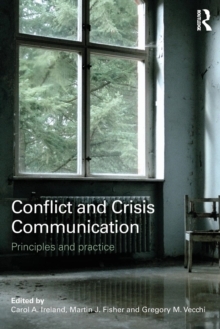 Conflict and Crisis Communication is an excellent source of reference for national and international law enforcement agencies, professionals working in forensic settings, and also postgraduate students with an interest in forensic psychology and forensic mental health.